With its constellation of Astra spacecraft, Société Européenne des Satellites (SES) of Luxembourg is delivering analog as well as digital television and radio services across Europe. 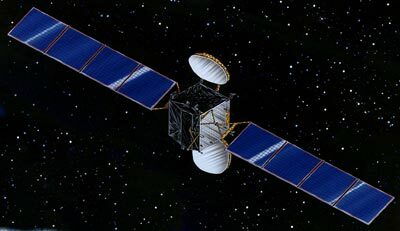 Hughes Space and Communications Company (HSC) was building a series of Hughes 601 and Hughes 601HP body-stabilized model spacecraft for SES in its facilities in El Segundo, Calif.
SES placed the order for Astra 1E in 1992; for Astra 1F in 1993. Astra 1F was the first western satellite launched on a Proton-K Blok-DM3 rocket, on April 9, 1996. The Hughes' HS-601 satellite was designed for the higher-power missions of the 1990s. The model was introduced in 1987 to meet anticipated requirements for high-power, multiple-payload satellites for such uses as direct television broadcasting to small antennas, mobile communications, and private business networks. The Astra satellites are similar in appearance to other HS-601 models, with each having a cube-shaped body and two solar array wings oriented along its north-south axis and the antennas located on the east-west axis. All the satellites operate in Ku-band and use traveling-wave tube amplifiers (TWTAs) for power. On Astra 1E, its 85 Watts. The power is 82 Watts on Astra 1F. Astra 1E carries 18 operating transponders and six spares. Astra 1F operates with 22 transponders for the first five years and 20 transponders (with eight spares) thereafter. The satellites enable SES to provide analog and digital television programs together. Most operate at 19.2 degrees East longitude. On Astra 1E, the on-orbit transmission frequency selection is increased to 66 possibilities. On 1F 56 possibilities are available, most in the BSS band. Because each spacecraft will provide an effective isotropic radiated power (EIRP) typically 51 dBW, these satellites deliver video and audio signals strong enough to be received by existing 60-cm dishes. The more powerful Astra 1E and 1F have four panels per solar array wing (26 meters tip to tip) to generate 4700 Watts and each has a 32-cell nickel-hydrogen battery.